A continued slowdown in the property market is having implications for other sectors. China’s real estate sector continues to lag following a decline in housing sales and construction starts over the first three quarters of 2014. The real estate malaise has brought slower GDP growth, from 7.5 percent in Q2 2014 to 7.3 percent in Q3 2014. Real estate prices began to fall in May of this year, and it is uncertain when the drag on growth will end. Declining demand for real estate has impacted sectors that supply inputs to property developers. For example, demand for steel, an important construction material, plunged even as the sector struggles with overcapacity. Average prices for the first half of the year were down 28 percent from the 2012 average, according to the China Iron and Steel Association. China’s cement industry also faces excess capacity. The industry was ordered to halt development of new cement production capacity in August as demand has not kept pace. In 2012, Ashvin Ahuja and Alla Myrdova analyzed the economic impact of a potential real estate decline in China on trade and commodity prices. They found that commodity prices could fall up to 2.2 percent below baseline one year after the shock. While it is not yet a year since the real estate market began to decline, commodity markets have been tighter as demand from China has slowed, and the markets have seen volatile swings. Falling activity in the real estate sector has also reduced credit growth. Until now, credit growth had relied to a significant extent on lending to the real estate sector; this is no longer the case. Banks and trust companies alike have sharply reined in lending to the real estate sector. Higher interbank rates and greater risk aversion have reduced loan growth. Larger property developers have continued to have access to credit, but small developers have faced barriers to obtaining the credit they need to repay existing debt. In addition, while a sudden freezing of the real estate market has been averted by policy easing, most recently by the loosening of mortgage rules for second home buyers, the market correction continues to play out. Chinese leaders such as Vice Minister of Housing Qi Ji and financial executives such as JP Morgan Chief Economist Zhu Haibin insist that the real estate decline is not a crisis and will play itself out without sharp ramifications for the rest of the economy. It does appear unlikely that China’s real estate decline will cause a full-fledged crisis, but the economic sluggishness resulting from the property downturn has stalled much needed reforms. Economic restructuring targeting the services industry is critical to generating a new foundation for GDP growth, but policy measures toward promoting this sector have fallen short of providing employment and expanding activity. Ironically, one reform that ought to take up the slack in the property sector – urbanization – is unlikely to fully resolve the housing glut. 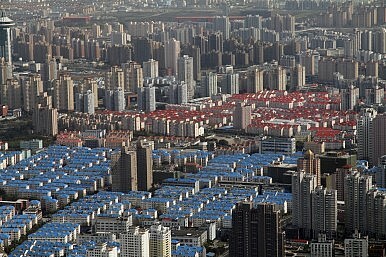 According to Li Gan at the Southwestern University of Finance and Economics in Chengdu, urbanization will not boost housing demand as significantly as is believed, since urban areas will be created in part by rural land reclassification measures that do not physically transfer residents from one area to another. Urbanization efforts are also unlikely to increase demand for housing in ghost towns, which often lack a critical mass of enterprises to employ would-be residents. While China’s real estate is not in crisis, it does show the unsustainability of fixed asset investment-fuelled growth, and the urgency with which China needs to find new sources of growth. Certainly some of the unemployed, educated youth who no longer fit the old economic model that employed millions of less skilled workers can help to drive forward structural change. When that becomes a reality, fluctuations in China’s real estate sector will revert to being a temporary glitch rather than a cause for alarm. The more conservative estimates of China’s future economic growth may underestimate its capacity to reform. Tough Times for China's Real Estate DevelopersChina's Latest Economic Data Beats Estimates5 Trends in China’s Real Estate Market in 2017Some of China’s Zombie Firms May Finally DieWhat Does ‘L-Shaped’ Growth Imply for China?